World-class manufacturers use NWA Quality Analyst Web Server to coordinate, standardize, and speed process reporting throughout the plant, enterprise, and supply chain. With Quality Analyst Web Server, you can instantly distribute your most current SPC charts to anyone, anywhere with a Web browser. The information you send can be defined to meet your customer or supplier’s requirements, eliminating the need for them to search through thick reports to find the information relevant to them. Users have the ability to view charts for a quick snapshot, or to drill down into the chart data for deeper analysis. This ability to produce up-to-the-minute, standardized SPC reporting worldwide through a universal analytical tool bridges the gap between remote locations and enables faster, more informed and consistent decision-making. 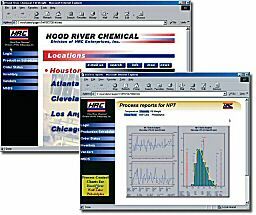 Anyone authorized can use a web browser to access your quality web site and view your SPC charts. No longer are remote operations or multiple computer systems a barrier. Now, everyone in your company or supply chain can speak the same SPC language. You can make faster, better decisions with a universal analytical tool, always with the latest information. 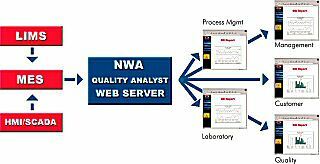 Quality Analyst Web Server gives you all the power, flexibility, and ease of use of NWA Quality Analyst. Now, you have the added benefits of the web. Yet you control access, content, and security. Quality Analyst Web Server takes advantage of NWA Quality Analyst’s powerful ability to link directly with corporate databases. You can view your SPC charts with current data, even real-time, at remote sites. Quality Analyst Web Server is the perfect way to tie your suppliers more closely to your quality procedures and requirements. By tapping into SPC data on their shipments, they can view your analysis in the format you prefer. You can also send your customers just the information they want, rather than making them search through detailed reports. To suit the needs of different users in your organisation, Quality Analyst Web Server provides two ways of viewing quality data. Casual users who want quick snapshots of SPC data simply view charts with a Web browser. This view shows static SPC charts with eye-popping clarity, color, and detail. You control who sees what and how-the level of detail, the data to be displayed, and the method of viewing. Quality Analyst Web Server provides exception reports displayed as web pages. 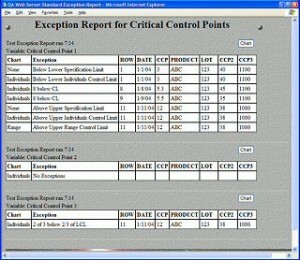 The reports list product specification and SPC violations organised by Data Set and Variable. 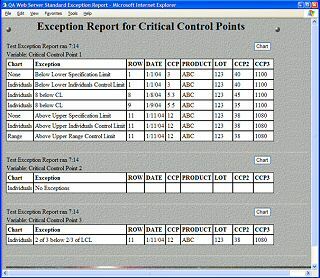 The relevant SPC chart for each set of exceptions is created with the click of a button. Customised exception reports may be developed using XSLT, and users can “subscribe” to specific exceptions with RSS. Quality Analyst Web Server uses standard Web technology, so it fits neatly and easily into your existing IT infrastructure and is easy to support. It runs under Microsoft Windows 95, 98, 2000, Me, NT4, XP, and Server 2003 operating systems. The application conforms to accepted Web security conventions and uses standard graphics file formats. Quality Analyst Web Server provides content and imposes no design constraints on your existing Web format. Quality Analyst Web Server also has page-serving capability allowing it to be used as the primary server for some applications. This feature simplifies setup and management of prototypes, pilots, and small web sites.